You'd think that having access to the largest variety and choice of Chinese food in the world would make us happy campers right? Well, yes and no. After back-to-back-to-back etc... days of Chinese food, we were about ready for a break. Now we weren't talking about burger and fries here. Rather, we made our way out to Yardbird north of Sheung Wan MTR station. Now when I mean north, I mean up the hill and many stairs. By the time we arrived at opening, we were a sweaty mess. But it was worth it though as Yardbird is one of the hottest spots in Hong Kong, serving up some mean Yakitori. 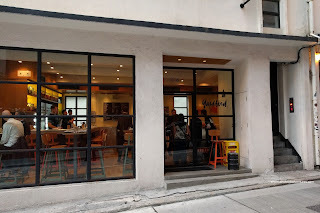 Since we were without the kiddies (thanks to my Uncle), we could enjoy ourselves properly at Yardbird (not really a place to bring kids). 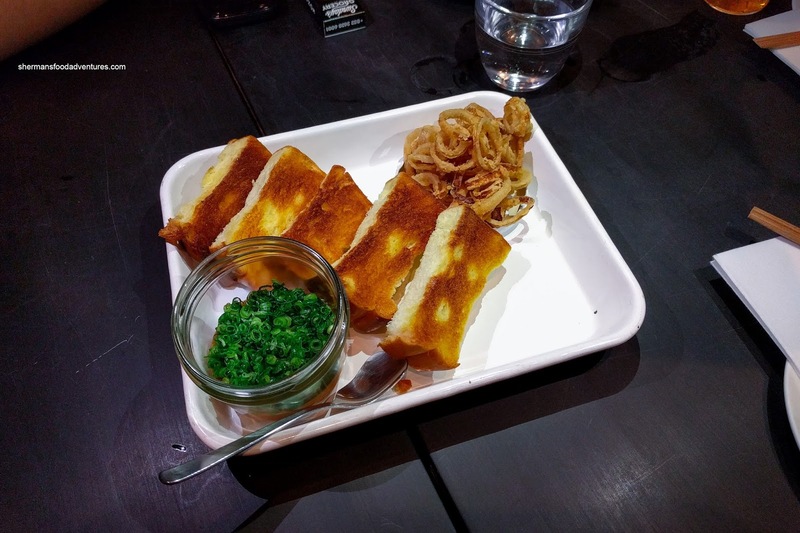 After ordering some sake, we started with the Liver Mousse with milk bread and crispy shallots. The thick and dense mousse was smooth and natural-tasting. Many times, pates and mousses are seasoned to the point where we can't taste the liver, not in this case. The brightness of the onions and the crispy aromatic shallots were a nice compliment. 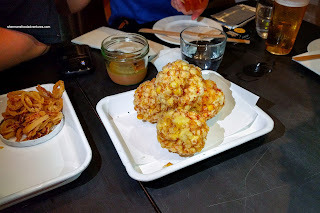 Next up was one of their signature dishes being the Sweet Corn Tempura looking tasting and majestic. These balls of batter and corn were delicious and texturally-pleasing. Only lightly seasoned with salt and pepper, the sweet pop of corn nestled in a crispy and light batter did the heavy lifting. 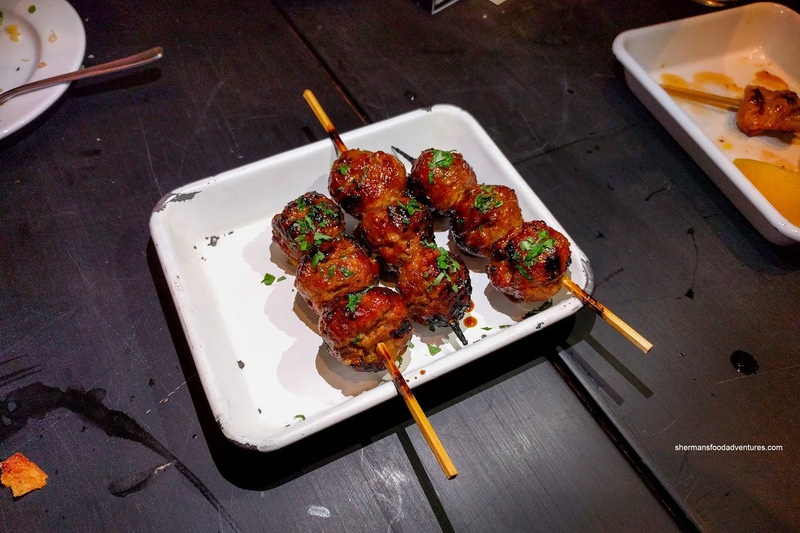 Next up, we moved onto the Yakitori with a selection including the Duck Meatballs. These were beautifully lacquered and caramelized where the outside was smoky, sweet and slightly crusty. Inside, the meat was juicy, tender and mildly seasoned. The little nuggets of white onion were still a bit crunchy where it added both texture and another level of sweetness. 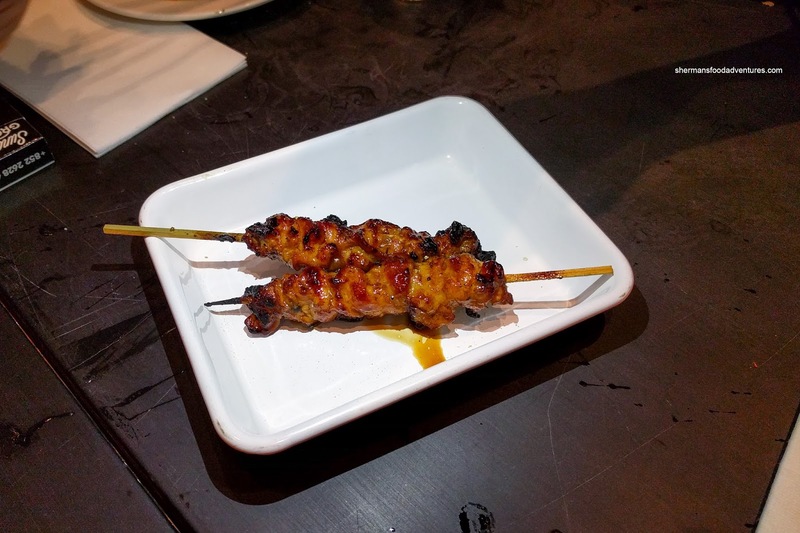 We also got a variety of Chicken Skewers including Inner Thigh, Neck and Rib. Our favourite was the inner thigh as it was super juicy, nicely brined and tender. It was lightly charred on the outside where the flavours were impactful while the natural sweetness of the dark meat came through. The neck and rib were a bit fattier and had more of a rebound texture. Staying with chicken (as the place is called Yardbird), we had the Chicken Meatball formed onto the skewer. 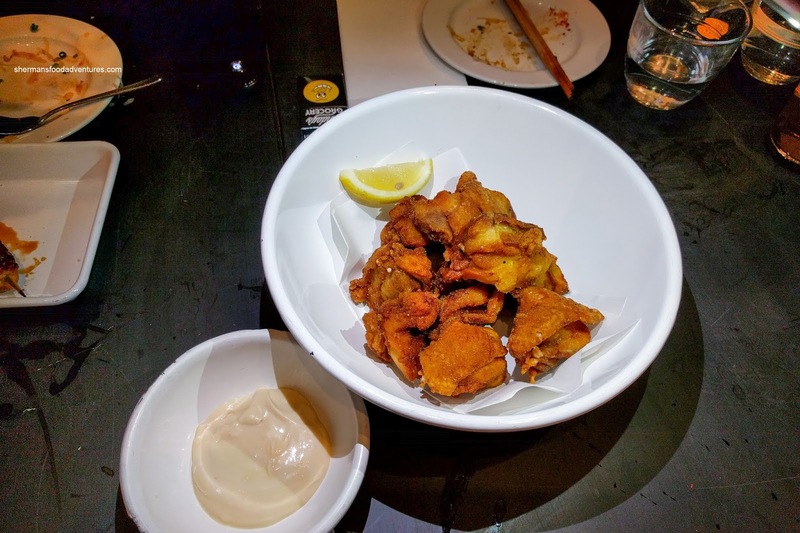 This was served with a side of tare and raw egg yolk that was mixed into a dipping sauce. 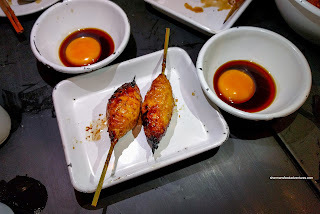 The chicken skewer was nicely grilled on the outside while the inside was soft, moist and spongy (in a good way). The sweetness was nicely accented by the salty and smooth yolk dip. 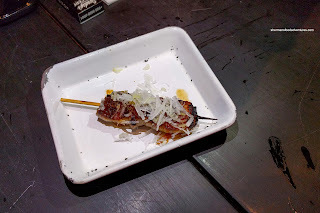 Moving away from chicken with our last yakitori was the Pork Belly with daikon ponzu and Welsh onion. This was also caramelized with a smoky and sweet crispy exterior. The belly was fatty and also meaty at the same time where it was tender. The brightness of the onions balanced the heaviness of the belly. 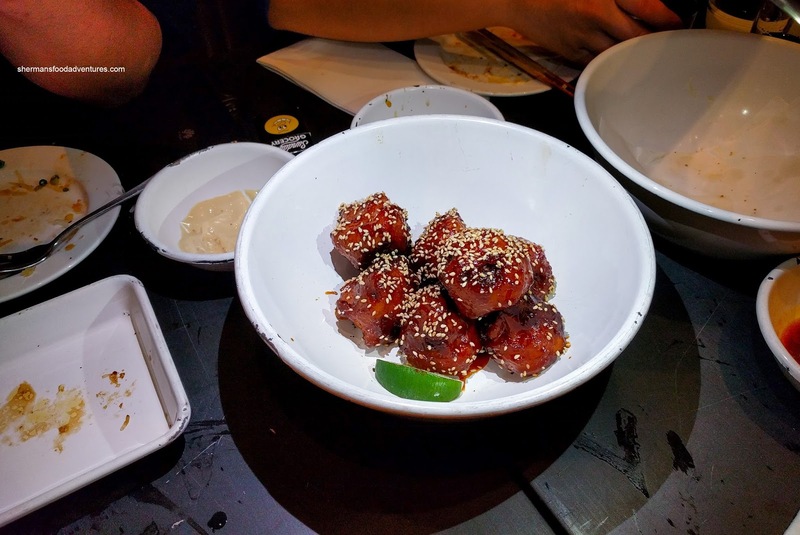 Onto another signature dish, we had the Korean Fried Cauliflower coated with a spicy and sweet gochujang sauce. 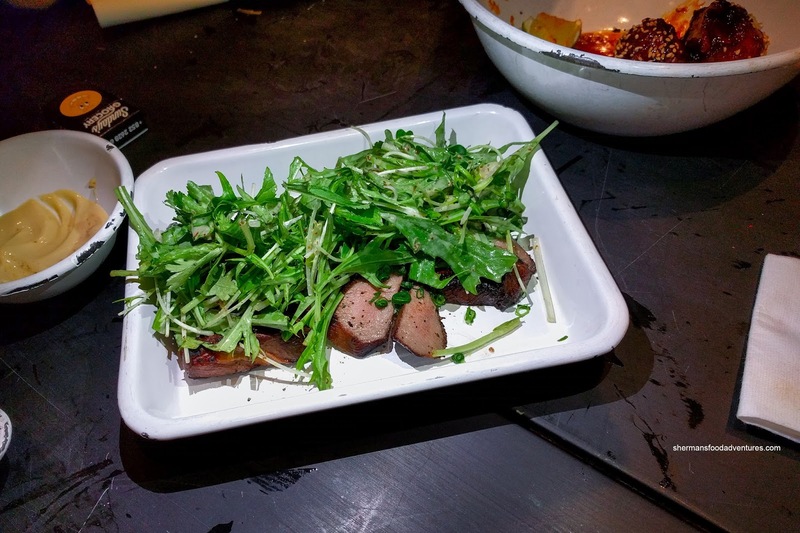 It barely clung onto each piece which meant that the whole dish wasn't too saucy nor wet. Hence, the coating remained somewhat crispy and didn't become gummy. Inside, the cauliflower was tender and fully-cooked. I would've liked it firmer though. Whatever the case, I loved the impactful flavours including the tartness of yuzu. Even better was the Fried Chicken with garlic and kewpie. Looking very much like chicken karaage, these large nuggets of dark meat sported completely rendered and crunchy skin. The meat itself was juicy, well-brined and tender. The side of sweet Japanese mayo was the natural compliment. Totally covered with Japanese herbs and drizzled with a mustard vinaigrette, the Ox-Tongue was well-seared and buttery. It was tender, but still retained a rebound and chew. Due to the fat content, ox-tongue can be rather heavy. However, the brightness of the greens and the acidity from the vinaigrette helped balance the dish nicely. 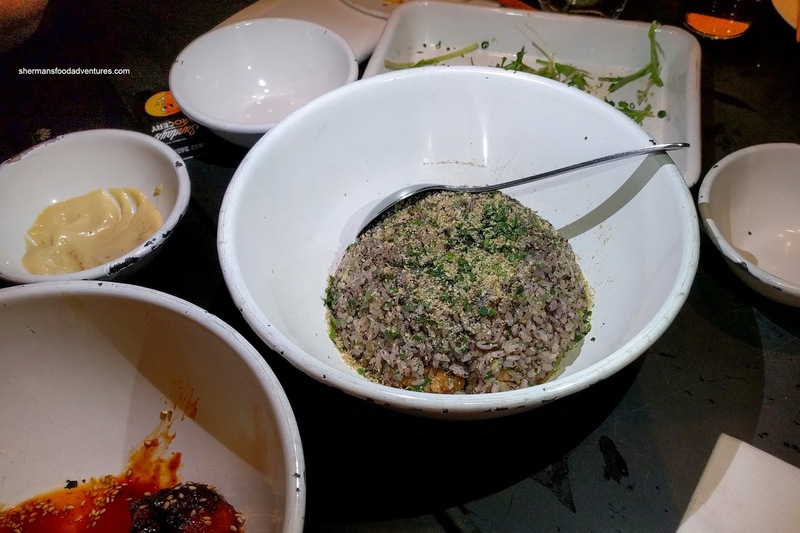 Our last dish was the Duck Fried Rice with shiso, myoga and onion. This was probably our least favourite items as it had very little pop. It was well-prepared though with chewy rice, plenty of duck and an interesting herbal finish. For me, it just paled in comparison to the rest of the dishes. However, the rest of the items were on point and delicious. This was a good break from Chinese food.